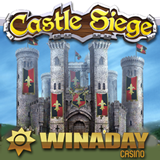 WinADay Casino’s has been leaking clues about the new Castle Siege slot for weeks, so we've been looking forward to the launch of this amazing Medieval battle themed game. WinADay creates all of its own games and, like all the others, this one raises the bar for online slots! WinADay doesn't advertise a lot of bonus promotions but they've got some good ones for this game launch, that's for sure. A $30 Freebie and two deposit bonuses are available. Take at least 60 spins on the new game by December 28 and you'll also be in a draw for $1500. Steeped in Medieval folklore, Castle Siege takes us on an epic quest for castle treasure. Three or more Bonus scatter symbols start a Bonus Game where we try to destroy the castle. When we do, there are three local jackpots to be won. Castle Siege has WinADay’s first “sticky wild”. If the Wild symbol appears while trumpets are out and flags are folded, Free Games start. During the Free Games, the Wild symbol sticks in one position and multiplies itself onto other positions. So it's a Sticky Multiplying Wild really! In addition to the 30 unique premium slots in its <a href="http://www.winadaycasino.eu/en/instant-casino">instant play casino</a>, WinADay also offers 15 penny slots and 10 video poker games as well as Roulette and Keno.